Cindy’s skill lies in finding the underlying causes for the chronic conditions and symptoms often experienced in modern life, such as difficulty maintaining focus, lack of energy, interrupted sleep, issues with digestion and much more. in which she’s long had an interest. “I’ve worked in health all my life, in a wide variety of areas including hospital, community and corporate services,” she says. 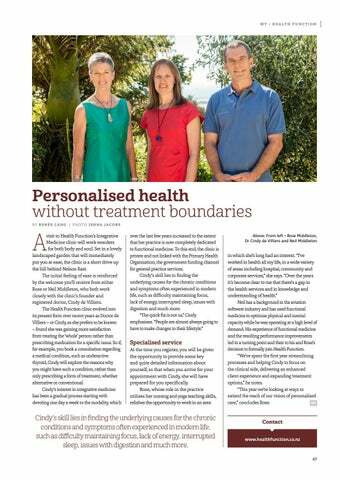 “Over the years it’s become clear to me that there’s a gap in the health services and in knowledge and understanding of health.” Neil has a background in the aviation software industry and has used functional medicine to optimise physical and mental capacity while he was operating at a high level of demand. His experience of functional medicine and the resulting performance improvements led to a turning point and then to his and Rose’s decision to formally join Health Function. “We’ve spent the first year streamlining processes and helping Cindy to focus on the clinical side, delivering an enhanced client experience and expanding treatment options,” he notes. “This year we’re looking at ways to extend the reach of our vision of personalised care,” concludes Rose.